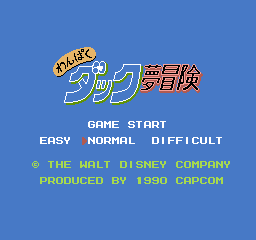 わんぱくダック夢冒険 © 1990 Capcom Company, Limited. Japanese release. Game developed in USA. See the original North American release entry for more info; "DuckTales [Model NES-UK-USA]". Released on January 26, 1990 in Japan.